A St. George businessman is suing an FBI agent and other authorities who investigated the public corruption cases against former Utah attorneys general, saying law enforcers threatened the man and his brothers with excessive force and jail time for false charges if they didn’t help incriminate the politicians in 2014. In hindsight, Robert Montgomery, the then-owner of a debt repair company, says he now believes he was a pawn in the sweeping investigation into three-term Attorney General Mark Shurtleff and his handpicked successor. Both former attorneys general were cleared. Montgomery was scared and confused by his implication in the cases, so he considered lying about what he knew of the politicians' alleged corruption to appease the agents, or taking a plea deal just to get out of the situation. He said the case ruined his life, causing him to lose his businesses, his wife and his sense of security. He stills asks himself, “Why me of all people? I’m a little telemarketer from St. George. Why me?" He landed on the same conclusion Shurtleff did last week, when he filed additional information in a similar lawsuit against Salt Lake County District Attorney Sim Gill and nearly every public agency involved in investigating accusations that he accepted bribes and was corrupt. Montgomery, like Shurtleff, says the investigation into him — which was ultimately dismissed — was fabricated and politically motivated. Gill is a Democrat who Shurtleff, a Republican, didn’t support for re-election. Swallow, also a Republican, was acquitted of his public corruption charges and is suing the state for $1.5 million in legal fees. The Montgomerys are specifically suing Utah Bureau of Investigation Agent Scott Nesbitt and FBI Special Agents Michelle Pickens and Jon Isakson. The three are also named in Shurtleff’s lawsuit. A spokeswoman with Salt Lake City’s FBI office declined The Salt Lake Tribune’s request for comment, as did the state’s Bureau of Investigation. Gill has denied wrongdoing in the Swallow and Shurtleff investigations, and he said he stands by the work done during that time. Montgomery and his brothers JD and Chase Montgomery were charged with witness tampering in 2014 after they allegedly attacked an FBI informant to interfere with an investigation, the one looking into the Swallow and Shurtleff cases. The issue, Robert Montgomery’s attorney Ted McBride said, is that the brothers didn’t know the informant, an employee at their business, was working with the FBI when he came to the business in May 2014 and apparently instigated a confrontation with Robert Montgomery. Regardless, none of them hit him. That was another employee, a manager at the company. Three months later, the brothers were arrested on suspicion of witness tampering. That charge carries a maximum of 30 years in prison. McBride, who is also representing Shurtleff, said the cases give credence to each other, and he is considering consolidating them. Shurtleff seeks more than $80 million in damages. Robert Montgomery said the FBI must have begun investigating him after he hosted two fundraisers for Swallow. He said he met Shurtleff once and didn’t know either of the men well. 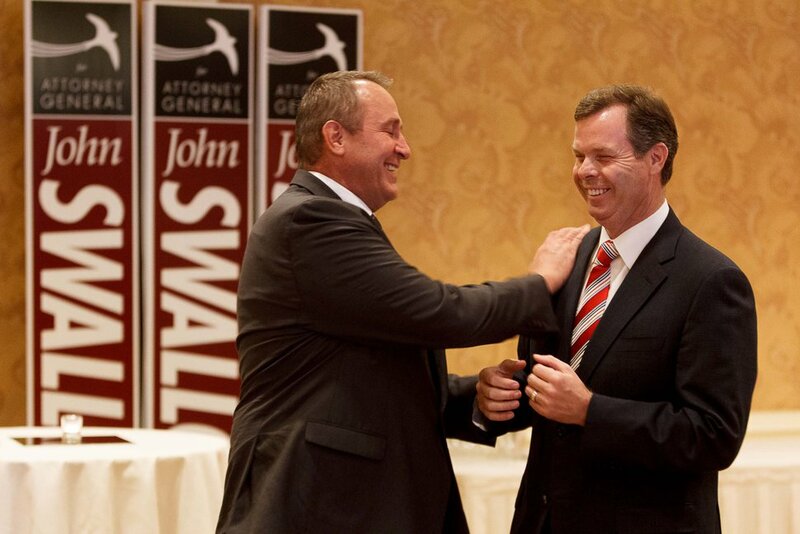 Trent Nelson | Tribune file photo Utah Attorney General Mark Shurtleff, left, and Republican attorney general nominee John Swallow share a laugh at a campaign event. Before he was charged, investigators asked Robert Montgomery about his dealings with Swallow, Shurtleff and others, but he didn’t have much to say. Unbeknownst to Robert Montgomery, the FBI planted an informant in his business. The man wore a wire for about four months but apparently never collected useful information. The informant, who had been fired, came to the business May 8, 2014, seeking his last check. According to Robert Montgomery, the man tried to provoke him into a fight — but it didn’t work. Instead, one of Robert Montgomery’s employees hit the man. The “that” came Aug. 8, 2014, when "three to five SUVs full” of armed law enforcement came into Robert Montgomery’s home and his business, allegedly pointing guns at Robert Montgomery’s wife and teenage son. Robert Montgomery’s brothers were also arrested that day. All of them were incarcerated for seven days, according to the lawsuit. “They were interrogated and were threatened with an exorbitant period of time in a federal prison" in an attempt to get them to disclose information about Swallow and Shurtleff, according to the lawsuit. On Aug. 12, 2014, the men pleaded not guilty. Prosecutors sought to keep them in jail awaiting trial because they were “violent criminals,” the lawsuit states. Two days later, an attorney for the prosecution appeared to have a change of heart and requested that the brothers be released. By October of that year, the case against them was dismissed. McBride said that’s one of the more striking aspects of this case. He wants to know what happened in those intervening days that caused prosecutors to to change their minds about keeping the brothers in jail. His attorney says investigators submitted falsified information to the court about the Montgomerys' charges, ultimately prompting prosecutors to throw out the case. The Montgomerys seek an undetermined amount of money for emotional distress, economic loss, attorney fees and other damages caused by alleged violations of their Fourth and 14th Amendment rights, which protect against unreasonable search and seizure and guarantee due process, respectively. Since the saga started, Robert Montgomery said, he’s developed post-traumatic stress disorder. He worries all the time about “being taken for no reason." Instead of running a multimillion dollar business, he now trolls for work online, selling business leads and brokering. He said he recently lost business when a potential client searched his name online and saw the allegations against him, even though the case was dismissed. All that, he said, because he tried to participate in politics.